It had been a long time between books in the ongoing History of Jensen saga when the second volume was released on 21 May 2004, 13 years after the databook came out. This second instalment is an edited compendium of factory Service Bulletins for the V8 cars, 1963-1976, primarily of interest to anyone owning one of the referenced models which is to say the C-V8s, FFs and all the different kinds of Interceptors. 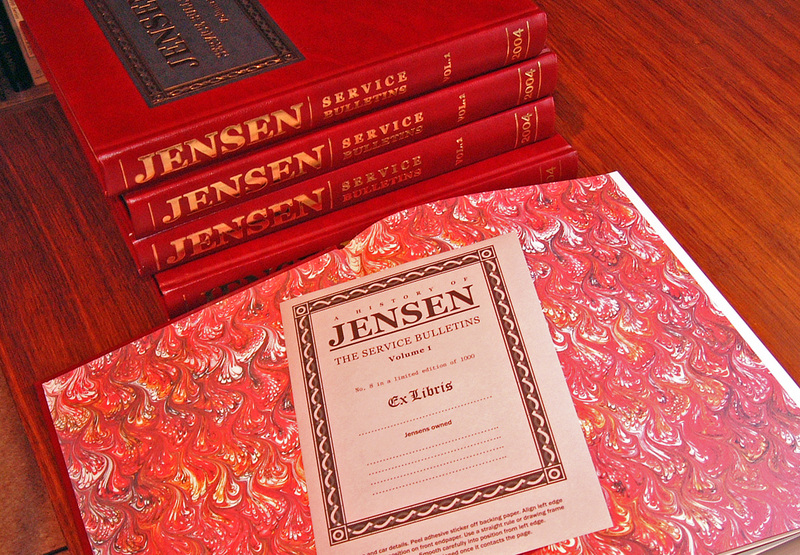 It's a huge production — 560 pages between the covers — and came out in a binding of Cabra leather, the first Jensen book to be produced in such a lavish manner. Each book comes with a numbered bookplate in the limited run of 1000 copies, making it still one of the most exclusive books yet produced about Jensen cars. I think you'll agree when you see it that it would make a worthwhile addition to any Jensen enthusiast's library. The Service Bulletins for the V8 cars exist in two series. One is the Home Market series, produced at West Bromwich and intended mainly for the British cars and the non-USA export market. These are what you will find in this book. For the USA and Canada, Kjell Qvale's Jensen Motors Inc. in San Francisco prepared a separate series based on (but distinct from) the factory series, running from 1970 to 1976. It would be nice if I were able to produce a companion volume covering these in due course but, until I do, our North American friends should find plenty of interest in this instalment. Contents-wise, the book provides what I believe to be an essentially complete collection of the Home Market Bulletins in the given period. Included are approximately 300 Bulletins and other documents of interest together with most of the Parts Bulletins issued as supplements between 1971 and 1974. There is an Annex containing other technical documents of interest, plus the factory-issued indexes to the Bulletins and a separate index to the contents of the book. In all, it adds up to about 125,000 words. Photographs did not form part of the original Service Bulletins and as such you won't find any in this book. However, there are approximately 130 diagrams and technical drawings included, plus another 130 drawings of the Special Tools required to service Interceptors. Reproduced in a modern font, and with all of the illustrations enhanced for clarity, these are the actual Bulletins sent out by the factory to the dealers, telling them how to fix all the things the factory should have fixed in the first place. Aside from the technical advice, drawings and diagrams, you will also find tables and charts covering just about everything which caused problems with the cars when they were new. For example, did you know that about 40 Interceptors and FFs had the door window springs installed upside-down? Some years ago I heard from an owner who owned one of the affected cars and he could not for the life of him work out why his windows were so slow in operation. At no time during the preceding 35 years had anyone worked out what was causing his problem. Or do you have really light steering? Maybe your car was one of the Interceptors which got the Jaguar rack input shafts by mistake. Fumes in the cabin? Guess what — all the likely sources for fuel smells are listed with explanations for fixing the problem. And there’s stacks more — paint codes, distributor mods, gearbox faults, carburettor changes, test procedures for the four-wheel drive and Maxaret, function charts for the air-conditioning and heater system, lists of parts for the three different kinds of Powaraks used on Interceptors (how many kinds did you think there were, anyway?). The list goes on and on. The man who signed off on almost all of the West Bromwich Service Bulletins, David Millard, very kindly agreed to write the preface to this compendium. David was Service Manager at West Bromwich for most of his stint at Jensen Motors which ran from 1965 to 1976. Towards the end of that period, he was a Director of the company. I interviewed him in England and found him a charming man with a great memory for the goings-on which took place all those years ago. His knowledge and direct experience of the period is great indeed and I am indebted to him for helping me put things in context. I am also indebted to several other individuals named in the introduction who helped me over the years in assembling enough of the now scattered Bulletins to make the compilation a possibility. While the bulletins will help those whose aim it is to restore their cars to original specification, I would sound a note of caution about taking the information too literally or aiming for too much originality. Personally, I am all in favour of originality — but in a practical and safe way. A better term might be “restification”, a process which draws together the best of the restoration and modification schools. Except for time warp finds, I doubt very much that it is now possible to recreate concours winning Jensens which conform in all respects to the pattern laid down when the cars were new. This is partly because that pattern is not known with certainty, but also because the specification changed, and continues to do so. To my way of thinking, preservation in use should be the aim of anyone who owns one of these cars today — but the form is entirely up to the owner. I'm presenting the compilation primarily for historical purposes, to draw a perspective on the era in which the cars were built and to enhance our understanding of Jensen motoring. 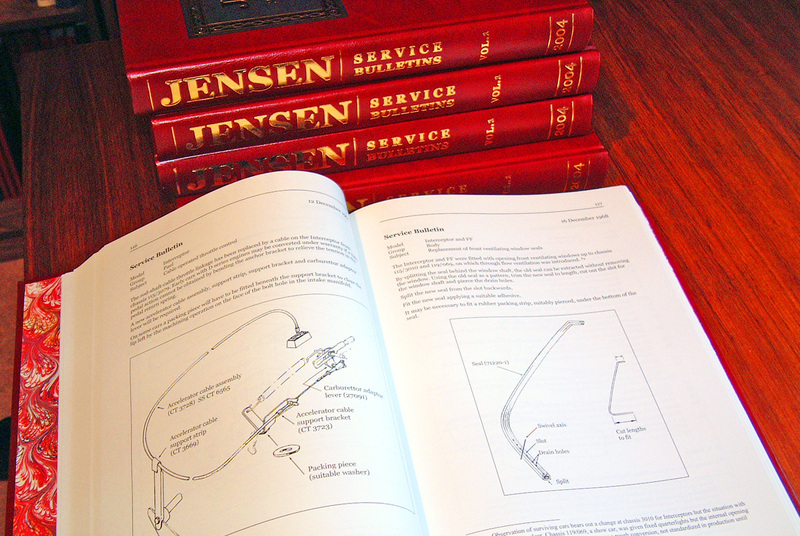 The book is not a "how to do" manual covering every aspect of a Jensen car — if you want that, get the factory workshop and parts manuals. This book is rather a historical read on how the factory went about addressing the many problems which emerged with the cars in service. As such, it has its place alongside the other publications you may already own. If you want to know what to do about your own car, you'll have to work it out for yourself by consulting all the available sources, which includes the Service Bulletins. I would stress that anyone who uses the Service Bulletin information to work on a car must appreciate that the procedures and materials recommended may no longer be appropriate, safe or legal. Indeed, I make a point of stating in the book that the onus rests with the user to ensure that any work carried out on a Jensen is not only effective but also legal and, given the capability of these vehicles, completely safe. Being one who values history, I have gone to some trouble to make this book potentially a little piece of history in itself. Those who have seen the tatty remainders of the original Bulletins will know that they were usually filed in maroon coloured ring binders. Therefore, for the cover of this edition, I have chosen a shade of Cabra — a deep burgundy colour — which reflects the original factory binding. I have also specified little things like gold blocking on black varnish, textured endpapers and head and tail bands to add to the luxury look, as befits a publication dealing with cars of the Jensen stature. Each book comes with an adhesive bookplate giving the serial number in this limited edition of 1000. There is room for you to inscribe your name and the chassis number/s of the cars you own, and at the back of the book are pages reserved for your notes in case there are features or specifications about your car which you want to include for reference. The idea is that, one day in the far-off future when you have gone to meet your maker, your car might still be around and with it this numbered, annotated reference to its innermost workings and secrets. I have another reason for numbering the bookplates and it has to do with future books in my History of Jensen series. 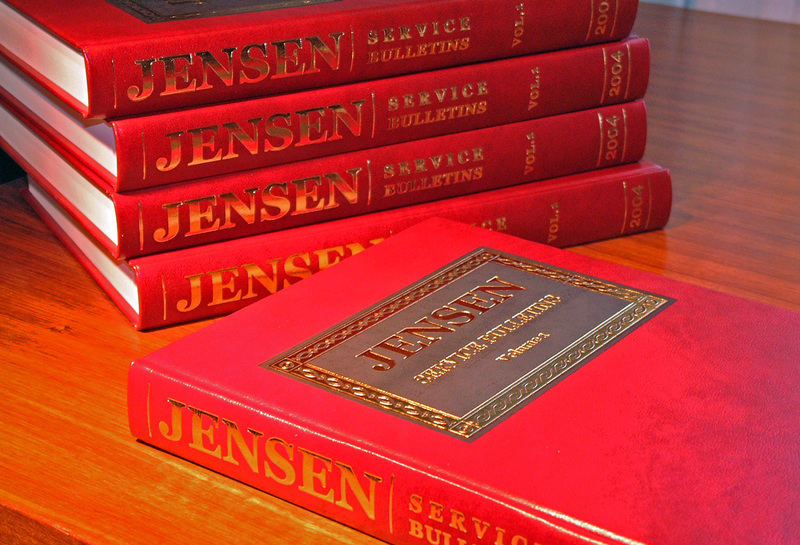 The series has already expanded to include more volumes covering different kinds of Jensen stuff. Each of these comes with a numbered bookplate so you can collect them all with the same number. To order a Service Bulletins book, go here. You can pay by Paypal, bank transfer or good old-fashioned cheques or checks, same as when the cars were made. 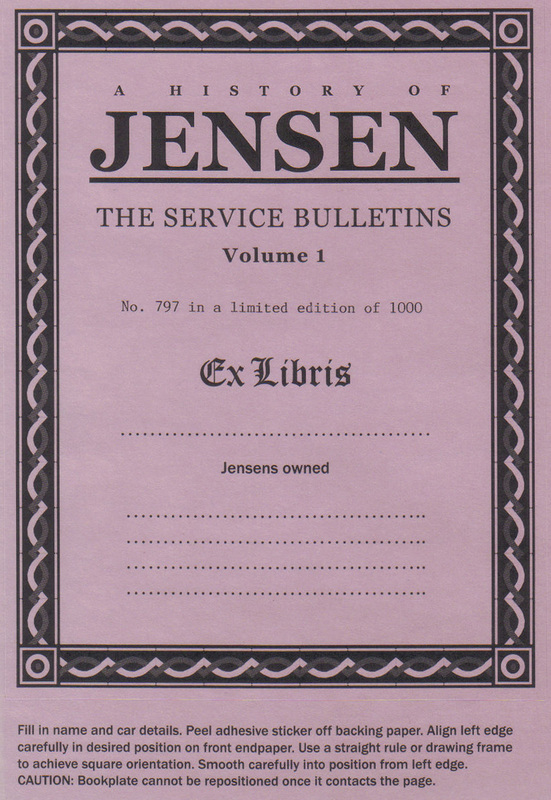 The Service Bulletins book was produced for true enthusiasts among the worldwide Jensen fraternity, of whom I count myself lucky to know many. To all of you, I commend the book and hope you enjoy it.